NO THIS IS NOT ME OR THE CONTINUATION OF THE MONTH FROM HELL! Disclaimer: your vehicle and your requirements are unique to your individual situation. My list is not intended as an all-inclusive list but as a starting point to develop your own plan. Your situation may require additional steps or items I have not mentioned in this article. This morning I was sitting here about 5:00 AM enjoying a cup of coffee catching up on the morning news and all hell broke loose outside. 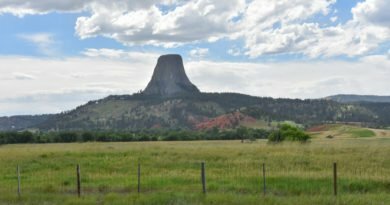 There were red and blue flashing lights in my window and when I jumped up to see what was going on I could see flames shooting into the air 20-30 feet or so on the other side of the RV Park I spend my winters in. I could see the flames over the top of the ‘hill’ as we call it so I knew it was a serious event. I grabbed my camera and ran over to see what was happening. So today we are going to talk fire safety for vehicle dwellers. This applies to anyone who lives in a vehicle no matter if is it a Class A motorhome, van, box truck, Class B, C… Etc. Preventing fires in your home on wheels. I want to mention right up front that I welcome your ideas and comments below. As warranted I will update the list I’m sharing on my website to create an updated video if needed. A little about this dramatic fire first. It’s been chilly here in Tucson overnight the last week or so, down into the upper 30’s. This morning it was 41 degrees when I stepped out the door to investigate and capture this footage of a fully involved RV fire. I thought it may be an electric heater gone wrong. 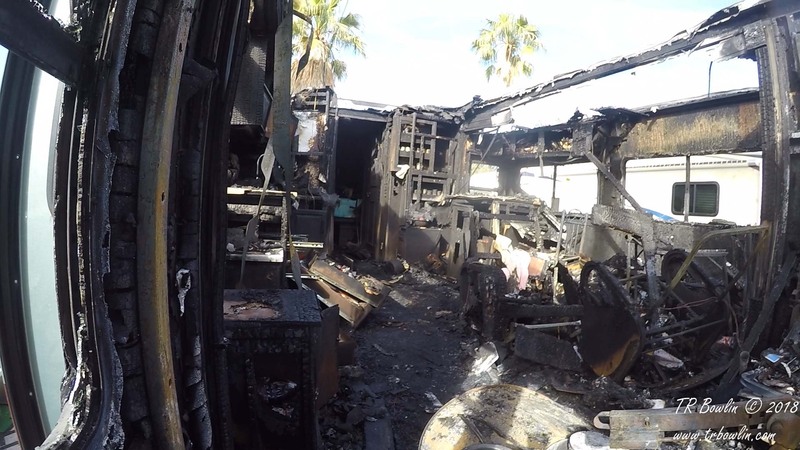 It was a newer class A Winnebago Tour owned by an older couple who winter here in Tucson and it is a total loss! Their fire detector had not alarmed!!!! But from what I could see I’ll bet the fire was venting out the roof and not producing a lot of smoke in the cabin of the RV when it first started. First off I am heartbroken at the loss they suffered and happy that no one was injured. The RV community is strong and neighbors were bringing clothes and necessities to them while the fire was still burning. They were lying in bed and the wife heard something crackling so she jumped up and ran outside to see flames leaping out of the top of their RV. She screamed at the top of her lungs to wake the neighbors to alert them of the fire. Then she ran back inside, woke her husband and grabbed the dog, her phone and their laptop and escaped. Luckily there is a fire station just a couple of miles from the park we are staying in and they were here very quickly and got the fire knocked down and protected the 5th wheel and trailer parked on either side of their coach. Early reports are it appears that it was their refrigerator that started the fire. Thank goodness no one was injured but their RV is clearly a total loss! I have a little experience with fridge fire in Rust my RV that happened sometime in the past. I don’t know when it happened I discovered it replacing dead Norcold or ‘Nevercold’ as they are affectionately called. 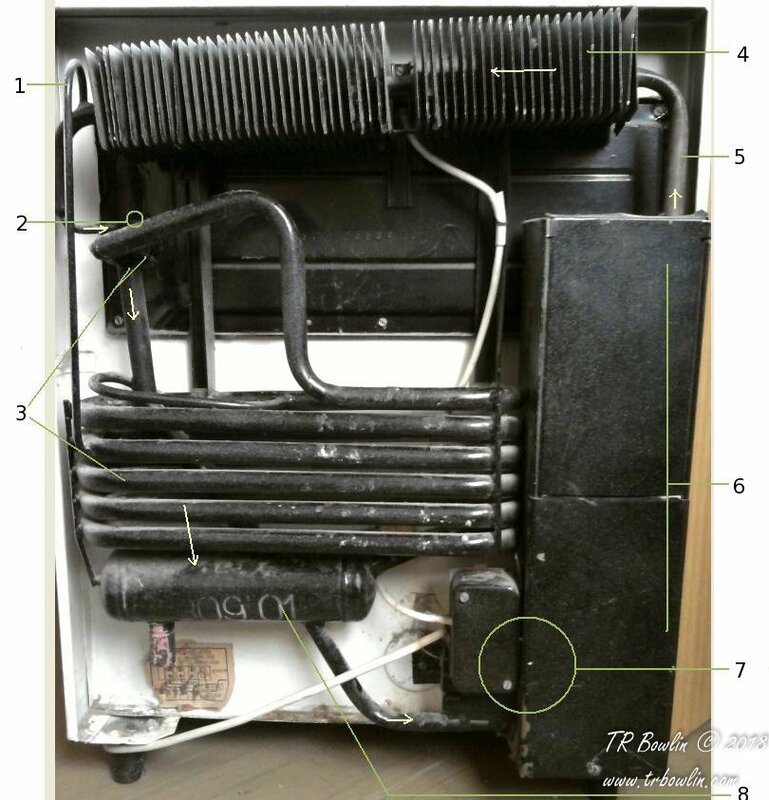 MOST RV fridges use an absorption refrigeration cooling system. Absorption cooling was invented by the French scientist Ferdinand Carré in 1858. The original design used water and sulphuric acid. Mine old fridge was Hydrogen/Ammonia/Water based. It’s interesting to note that Albert Einstein and Louis Szilard held a patent on a variation of the concept but I digress. It works likes this… When the refrigerant (Hydrogen/Ammonia/Water mix) evaporates (boils), it takes some heat away with it, providing the cooling effect. 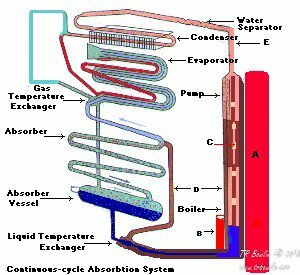 An absorption refrigerator changes the gas back into a liquid using a method that needs only heat, and has no moving parts other than the refrigerant itself. This makes them fairly reliable and meets the need of quiet operation…e.g. no compressor running making noise. So, in the case of my old Norcold the problem was it would freeze up but the boiler stayed on causing everything to overheat and catch the ceiling on fire above the vent. It also caused the unit to freeze up even harder and get hotter and hotter because there was less refrigerant being returned to the boiler. A very serious vicious cycle that has led to many RV refrigerator fires. A recall kit installed on my RV was designed to trip a relay when the boiler exceeded some temperature, I don’t recall the exact temperature but do know that it tripped several times during the time I had it and it had to be reset. 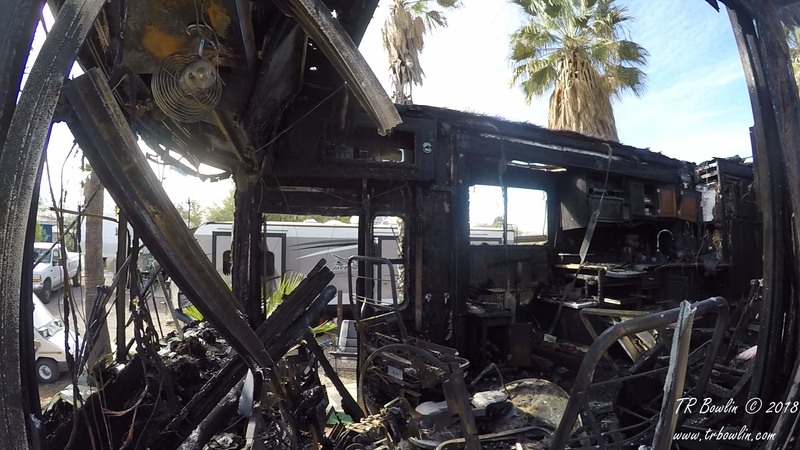 I read online that fridge fires are the #2 cause of RV fires, right after electrical fires. 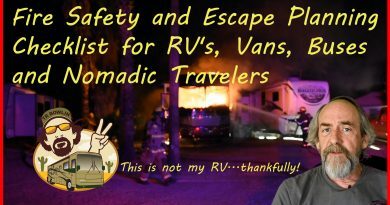 Not to cause too much alarm because they are fairly rare but I’ve seen more than a couple of RV’s engulfed in flames as I have traveled around caused by mechanical failures. Engine and transmission fires top that list along with seized bearings and brakes sticking or overheating from excessive use descending a steep grade! I even saw a totally burned out Honda CRV that one of the front brakes locked on as it was being towed behind a 40’ class A. I won’t comment on how you could not know that a break was locked on your toad. I would think it would put a serious drag on your engine. Electrical fires are particularly problematic. Remember that as you roll down the road things are shaking and moving around a lot! RV manufacturers know this so they tie down wires and what not to prevent them from wearing through. I mean just a while ago I had a hydraulic line fail because it had been improperly secured and rubbed through the hose on the frame. Rodents on the other hand can be a real problem! They love to chew on wire. If you’re camping in an area where you think there may be mice set traps proactively, when you first get there, and check them regularly! Mice and Rats can raise hell on your wiring and you may never know it. Set a trap or two in your basement or underside storage areas and check them regularly. Put one under the hood of your tow vehicle (truck or toad) and check it too. More on mice prevention in a future episode. An important thing to keep in mind, RV’s are small and sometimes there may be only one way out. And because they are small things can happen very fast. A fire can quickly block your access to a door so be sure you have an escape plan where you can bust out a window if needed to get out of your burning vehicle. More on that in just a bit. 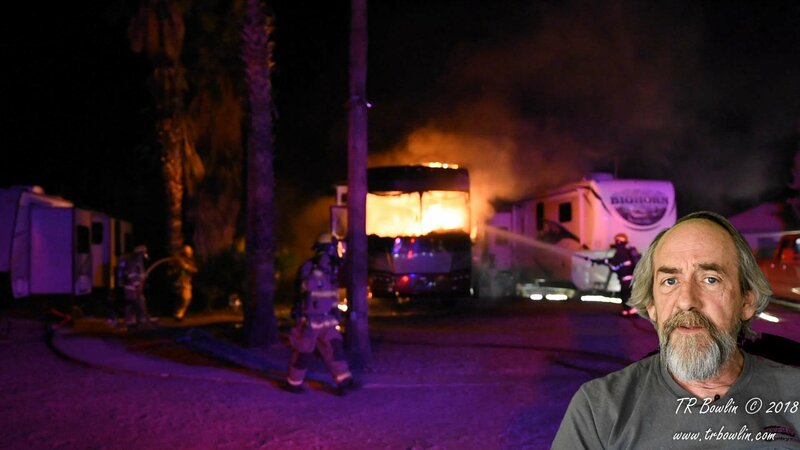 The take home message is that fire is a real danger to vehicle dwellers, and I use that to encompass the entire range of RV’ers, Van and Bus lifers, etc. WE all need to be aware of this but with some simple measures you can reduce the risk of a fire greatly! Let’s talk about a few of them. 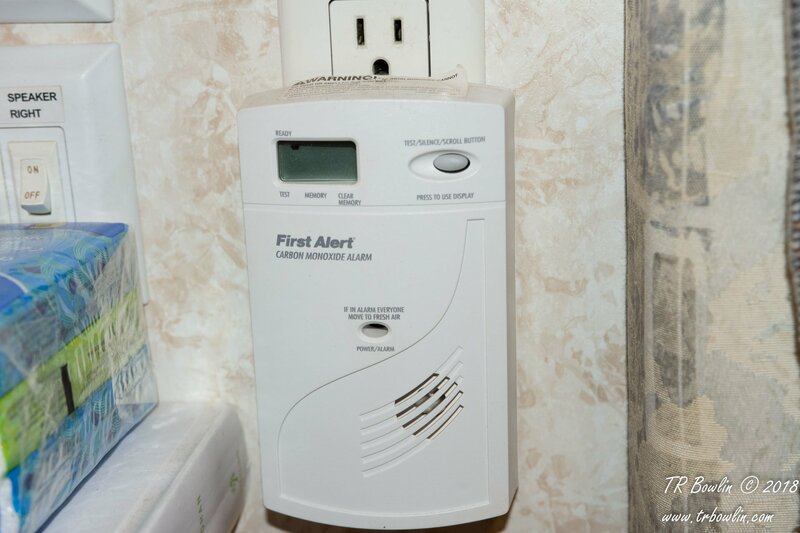 First… I’m going to call them Life safety detectors… Smoke, propane, and carbon monoxide detectors are a must have for everybody. Each can save your life and it is important to switch out the batteries on a regular basis. A good idea is to get in the habit of switching them out every spring and fall during daylight savings time. Check them regularly! Most have flashing lights to let you know they are working… It’s simple to look a see if they are flashing occasionally. Do it! 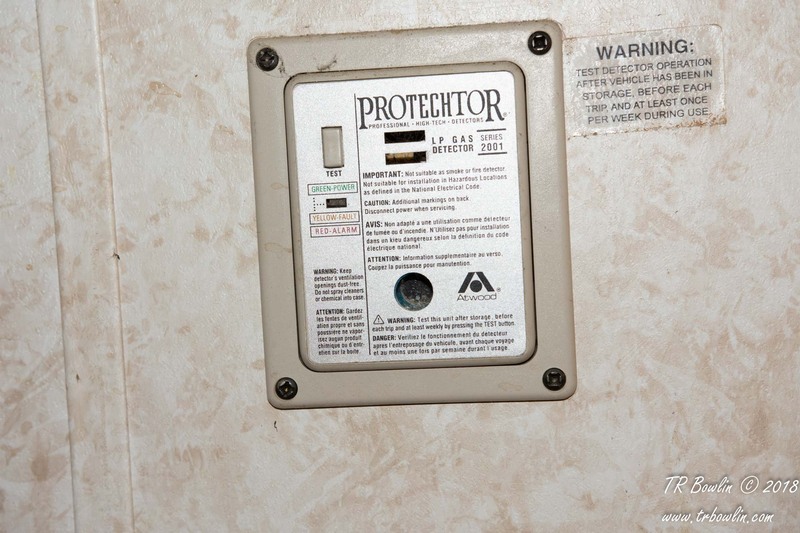 In my RV I have a built in propane detector that I leave on all the time. It is hard wired to the house batteries and it draws practically no power. If you use any fuel that produces a flame to cook or heat you need one! Smoke and Carbon monoxide detectors are very important as well. If you have a coach with the sleeping area separate from the living area you should have two. One in the bedroom and one in the living area at a minimum! If you’re a bus or van dweller you should have them too. They are only a couple of dollars but could save your life. There are even combination units available on the market that are way worth the investment. Have an escape plan and practice it! Know how your egress windows work and be prepared to break a window out if needed. Any commercial RV is required to have an egress window in both the sleeping and living areas. I’ve seen a lot of vans and buses with no egress at all. More than one person has said to me ‘oh I would just kick the window out’. This may not be an effective strategy. Depending on the window construction you may find window or window framing may be very difficult or impossible to break depending on your physical state. Remember the P’s… Prior Planning Prevents Piss Poor Performance. …PPPAED Prior Planning Prevents An Early Death. Pay attention to where you are parked. It is easy to navigate to a place on your Garmin and you not remember the physical address of the place of where you are at. Be it a Wall-mart, truck stop or rest stop along your way know where you are. MAINTENANCE cannot be over emphasized. You must keep your RV maintained. Inspect it regularly and if you do not feel comfortable doing that yourself take it to a reputable RV shop and have them do it. A monthly look at things is a good idea. 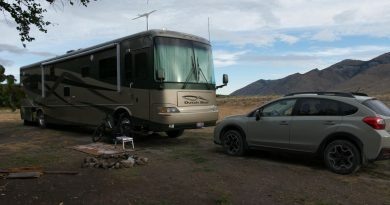 Keep your RV’s appliances clean and maintained at all times. Open the panels to your appliances to make sure there is no debris, critters, or loose wires. If you spot anything out of the ordinary, and you’re not comfortable addressing it then it’s best to call an electrician. With the electricity turned off vacuum out the vent openings on the roof and dust that has accumulated in and around the fridge rolling down dusty road. Look at the wiring and other equipment and check for signs of overheating like discoloration. 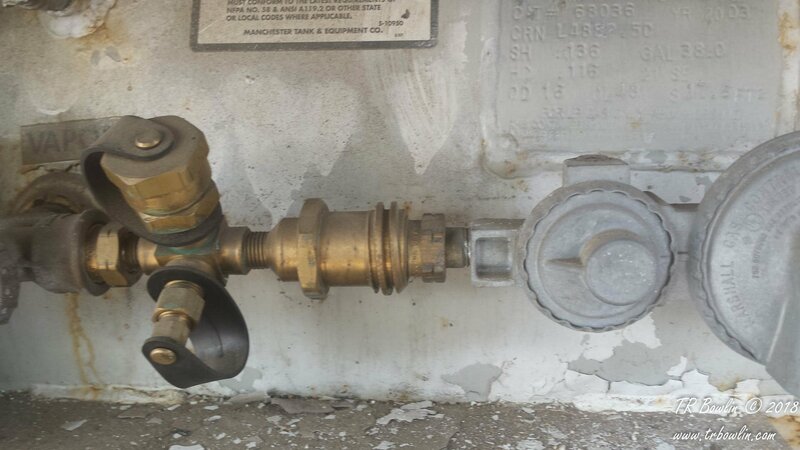 Or evidence of refrigerant leaks also noted by areas of discoloration. For maximum safety you ‘should’ turn off your propane tank when you’re rolling down the road, but who does this??? I’ve never done this unless I was taking a ferry or driving through a tunnel which was required. Otherwise we have it so our food stays cold when were not on 110 power so it’s on pretty much all the time right? Enough said. Use propane standalone (Buddy, big buddy, etc.) or electric heaters with great caution. Never leave one of these things running when you leave the RV. You’re just asking for trouble if you do. Don’t plug too many things into one outlet, especially things like heaters, fridges, etc. 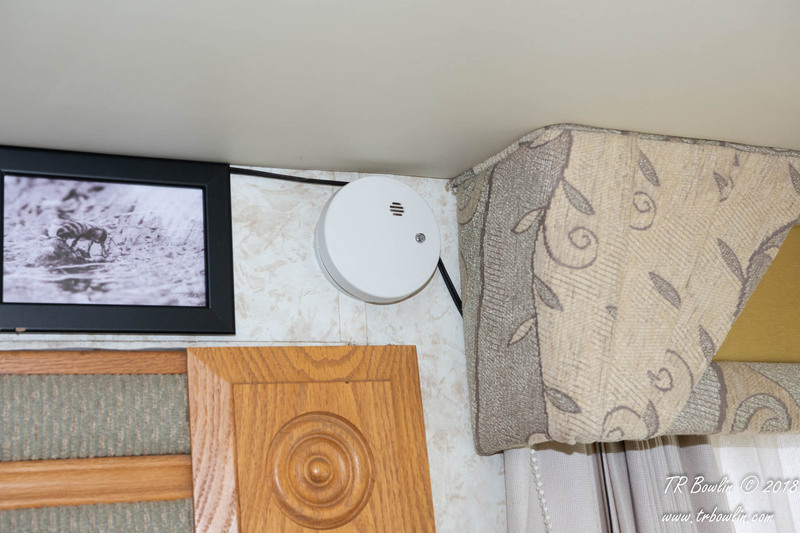 Try to spread the loads out throughout the RV as much as possible. Hopefully the circuit breaker protects you from a fire but it’s best to be proactive about this. Use fire with care. When cooking or grilling outside be sure the area around is clear. Same goes with campfires — be sure the area is clear and that they are far enough away from your RV that they can’t catch it on fire! About 6 years ago at a KOA campground in Ohio I saw the aftermath of someone who what their grill up against the RV when they were cooking. It’s wasn’t pretty. Batteries… And I am talking all kinds of batteries. Many RVs use lead acid type batteries, which need to be properly ventilated, as they can emit dangerous explosive gasses. One particularly nasty one is Hydrogen Sulfide. Here’s the thing about hydrogen sulfide, produced in moderate quantities when you charge or use your batteries for power in the RV, it’s a double killer. If it doesn’t suffocate you through lack of oxygen it kills you when it explodes. To prevent this your battery storage area MUST be vented to the outside! 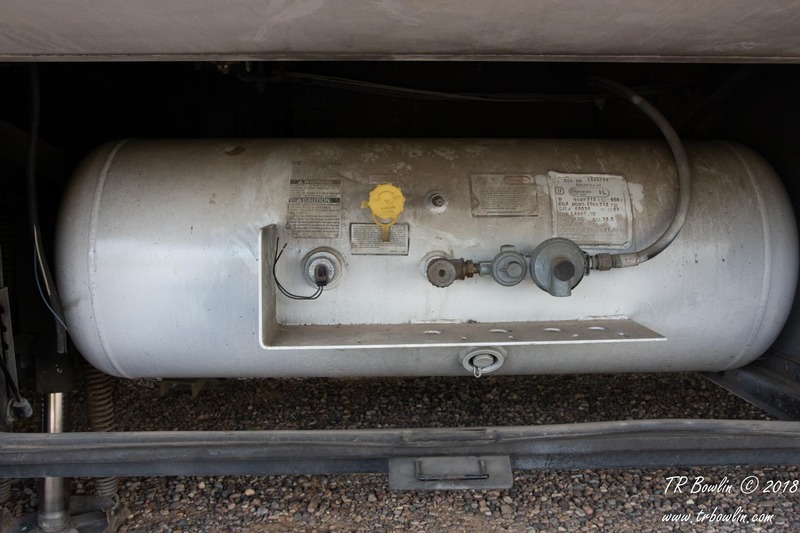 By the way, your RV’s black tank can produce hydrogen sulfide if it is not maintained properly. Probably never enough be explosive but it sure can make it miserable to be in your RV at times! I’ll refer you to my Bio-Geo black tank maintenance video up there for more info about that. Lithium batteries present a particularly tricky problem. Famous fire causers bringing down everything from air planes to scooters! I’m not going to talk about lithium batteries that are used to replace your house batteries, but those extra batteries you have laying around for electronic equipment. This personally happened to me a couple of years ago. I had a screw driver weld its self to the terminals of a camera battery. I laid it there accidentally and didn’t discover it till I could smell plastic burning! This could have been a huge problem if it had been in a drawer or other place where I didn’t smell it before it was out of control. Fire safety is nothing to be taken lightly. It can happen in a second and does many times every year to good people like you and me. Taking a minute to stay on top of these few things will help minimize the chance of you experiencing a life changing disaster. I’ve prepared a fire safety checklist you can download from my website. I’ve also included a companion article if you would like more information. 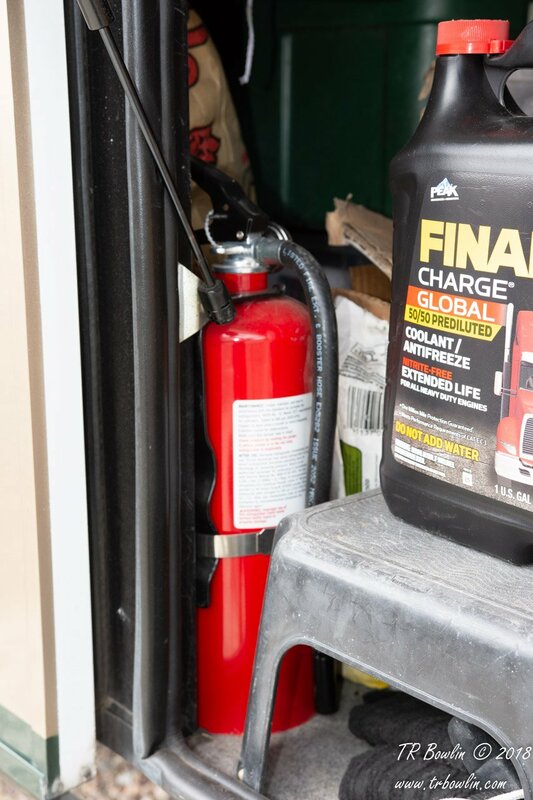 Your welcome to use either or both to help making sure your home on wheels is fire safe. Disclaimer… your vehicle and your requirements are unique to your individual situation. My list is not intended as an all-inclusive list but as a starting point to develop your own plan. Your situation may require additional steps or items I have not mentioned in this article. I’m sure there is plenty I’ve missed so I invite your comments below and if enough come in I will remake this video with your suggestions added. I will also be updating the checklist with your comments and ideas that I’ve overlooked.